Once you open the back door, your pooch takes off like a hypersonic plane. He does laps around the deck, zips from stick to stick, and sniffs every shrub in sight. Similar things happen whenever it's announced that "it's time for a walk!" Your furry friend races to his leash and brings it to you. (Cue the sympathy of, Awww's.) Make your walks more aww-worthy by outfitting your pup in a felicitous pet costume to emphasize his super-speed and cuteness too. The Rainbow Dash dog costume is a great way to draw even more attention to your fluffball whenever you two are at the park. Everyone wants to pet a dog that's a half pegasus! This is a convenient dog costume with a comfortable fit for all-sized dogs, XS-XXL. 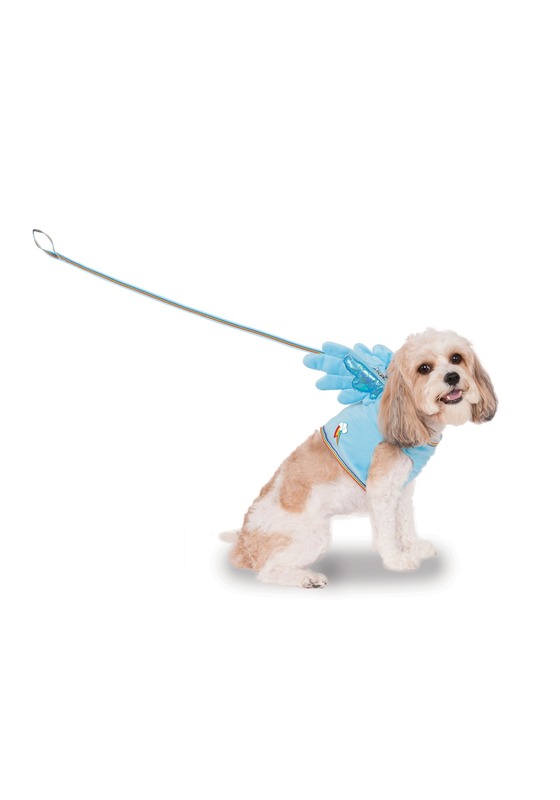 Slip it over your pooch's head and pull their paws through, then hook the leash onto the attached harness. The officially licensed costume also features a rainbow trim, Rainbow Dash's cutie mark, and a pair of metallic blue wings. Now the whole family can dress up to match the dog who's dressed up to match Rainbow Dash. We have coordinating MLP costumes, apparel, and accessories for women and children too!